The PennEast Pipeline Company is trying to build a 118-mile pipeline that will carry “fracked” gas from Marcellus Shale wells in north-central Pennsylvania, across the Delaware River and through the Highlands region into Hunterdon and Mercer counties in New Jersey. The PennEast Pipeline is dangerous to our water and wildlife. The path runs throughout the Delaware River Watershed, which provides drinking water to millions of people. It would cut through some of the cleanest streams in New Jersey and Pennsylvania that we use for fishing and swimming. No matter what PennEast does, we’ll see pollution from construction and ongoing risk of spills and gas leaks. The good news is that local opposition has succeeded in slowing down the project. If we can build on that opposition, we can send a clear message to FERC that the pipeline is dangerous and unnecessary. We’ve joined with allies across our region because the PennEast pipeline poses a massive threat to our land, drinking water and air quality. 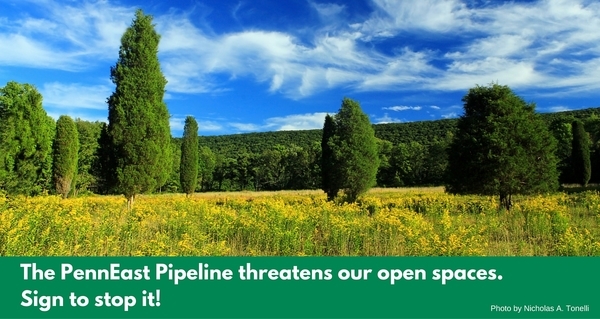 Sign our petition now telling FERC to reject the PennEast Pipeline.